Last weekend I was pleased to participate in the Artisans Craft Fair, presented by Grace Co. Handmade as a fundraiser for her 2015 mission trip to Carrefour, Haiti. 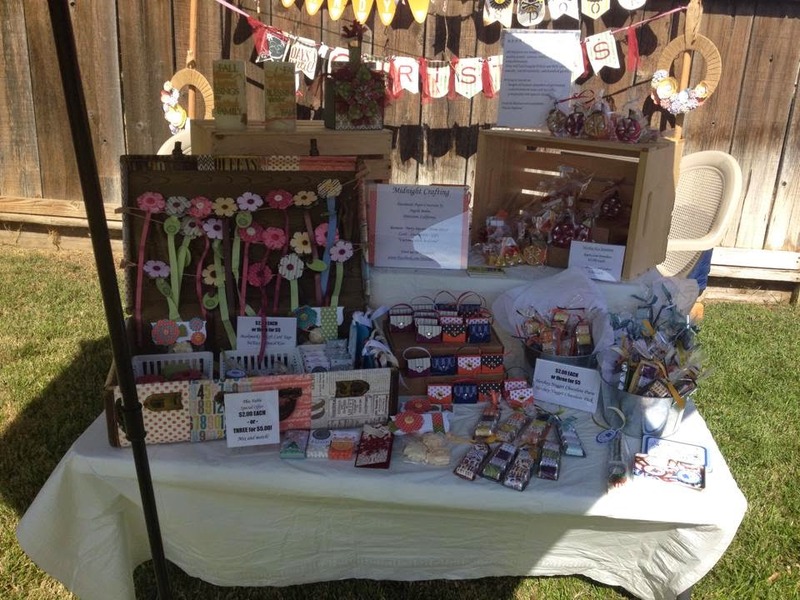 It was a gorgeous day for an outdoor craft fair! We were not using pop-ups, so I had to come up with an alternate way to hang my banners. This was a fun challenge, made easier with the help of my master-builder friend Kristin, and my handy hubby! I think the end result was good, and with some tweaks might be a great display for me! We looked at a few ideas online, but came up with this final idea thanks to Kristin. I used 2 8ft closet rods with clothespins attached at 1 foot intervals, and some jute cord. The bases were these big 12x6" wood remnants from the lumber store, that Mr. Man so helpfully drilled with holes for me. I took some bricks to add if the wind picked up, but the stands worked just fine, and they were not so heavy that I couldn't set them up myself. The posts are not fixed in the bases, so its easy to dis-assemble and pack up. The Boo Banner is hand inked canvas, with paper accents. I used bat punch art, and a little ghost to spook it up. 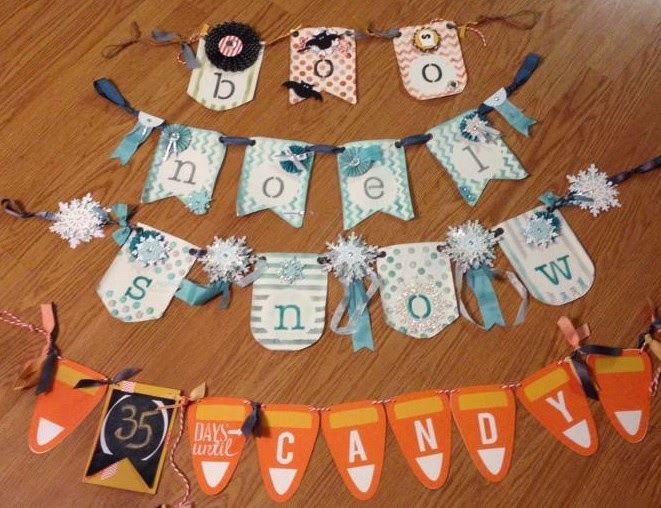 The Noel and Snow banners are also hand stenciled canvas, with ribbons and rosettes and some snowflake ornaments made of paper. The Countdown to Candy is made of paper with a chalkboard pennant and a hanging piece of chalk to help you count down to Halloween. 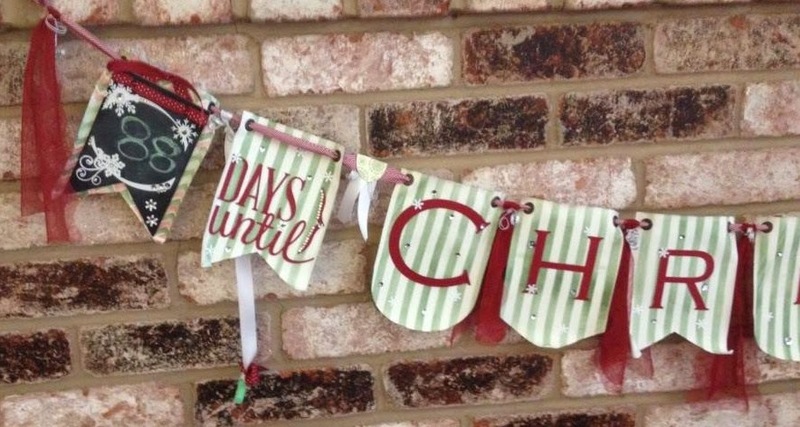 The Countdown to Christmas banner is made with the hand stenciled canvas, paper die cut letters, and a chalkboard pennant accented with vinyl snowflake cutouts. 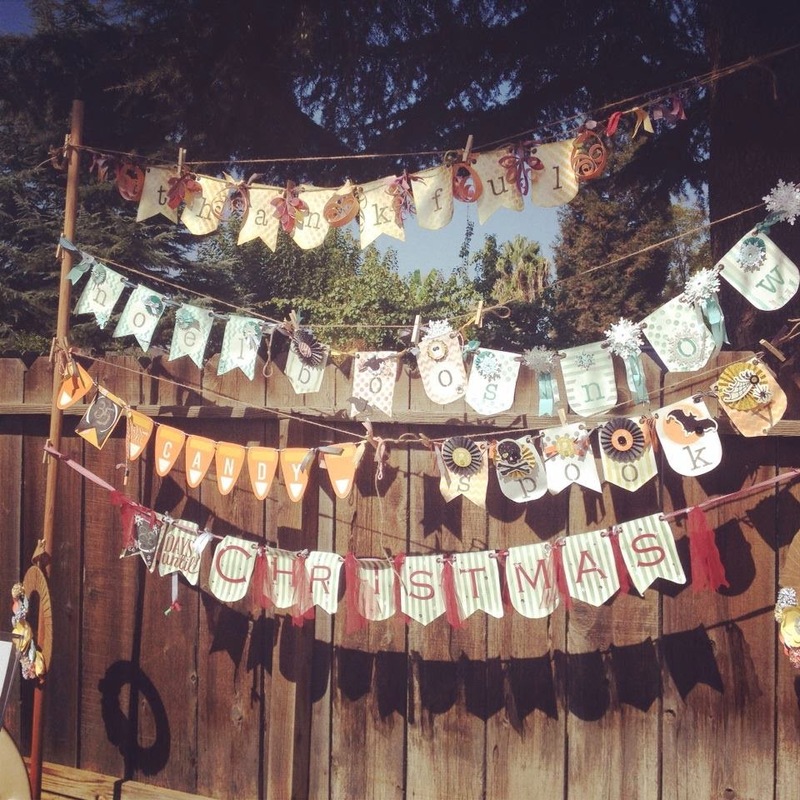 I also included a hanging piece of chalk to keep track of the sweetest season! 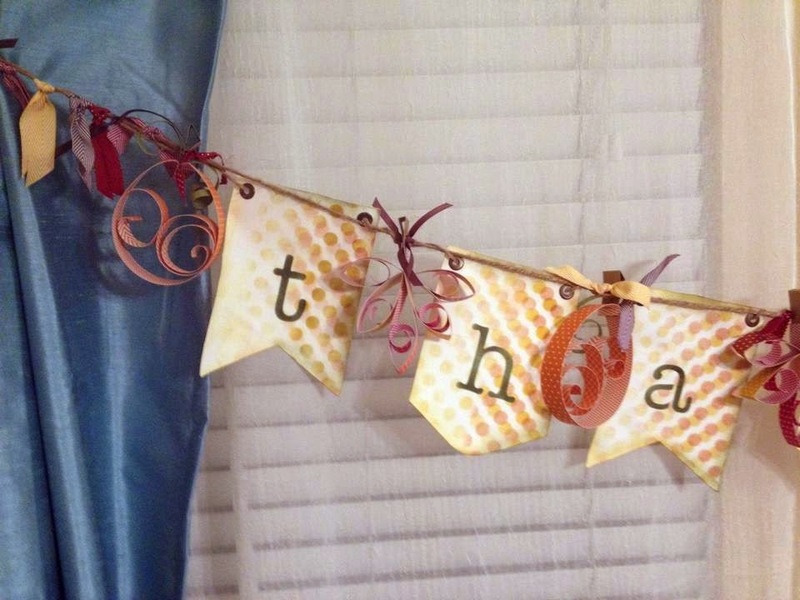 The Thankful banner was definitely a work of heart. I hand stenciled the two-tone background and letters. The leaves and pumpkins were all evolutions of my earlier garland paper art pieces. I love the combination on this banner, and was Thankful for all the attention it got at the fair. Definitely one I will have to make again for my home. Participating in this fair as a crafter rather than in my usual Stampin' Up! Vendor mode was both scary, and educating. I know how to share my love for the great Stampin' Up! products I sell, its hard not to rave about the benefits and qualities of my favorite stuff! But giving glowing reviews of my own handmade work seemed a little boastful... I was not quite sure how I would interact with people. All I knew as I went into it was that I loved making the items I brought! It had been so nice to make things that I've wanted to make, for so long, but haven't made the time!! It was different than deciding what product I could feature, which promotion I would showcase, and how to display and convey information. I did play with my display, I used my suitcase again, and my wooden crates. My tables were set up a little different, and I had an umbrella to shade my chocolates - oh the CHOCOLATES!! It was an adventure, I really had no expectations other than a pleasant exercise in crafting. It ended up being my most enjoyable outing to date!! On several levels! I took my daughter with me this time. She looked forward to it, asking me every day - "How many days now, until I get to go with you to the craft thing??" It was the last afternoon I got to spend with my friend & fellow crafter, she actually moved away the following week. And I loved seeing peoples reactions to my treats and creations. Seeing the joy someone feels when they buy a gift for someone, and hearing all the stories of who would be getting the gifts. SO heartwarming! And they bought ALOT of gifts!! Whats not to like about that! I really felt a different welcome from the other Artisans, and the customers who came through the fair. All seemed more open to and appreciative of hand made items - something that I find sadly lacking in many of the Vendor events I attend. Handmade is a different horse. I guess it was hard for me to separate the two in my own mind until I had experienced this craft fair. I had wondered at the disinterest and highly varying success rates at other shows. I now recognize this was most likely due to that 'handmade' quality. People at vendor fairs are not always the same people who appreciate or create handmade items as gifts, part of a hobby, or as a business. They can be!! But in my experience, not so much. I now know to do better research, how to better blend in or separate my Stampin' Up! sales side, and to find events that will be more enjoyable and successful for me. And I need to spend more time with hands on creating. Being a Maker. It really is what I enjoy! !